You were sadly taken from us far too soon. We will hold onto precious memories, as not a day will go by that we will not miss you. Although we can't see you - you will always be by our side. Your squishy face kisses will forever be embedded in our faces and hearts. 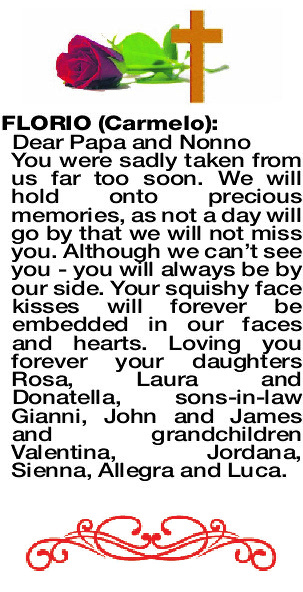 Loving you forever your daughters Rosa, Laura and Donatella, sons-in-law Gianni, John and James and grandchildren Valentina, Jordana, Sienna, Allegra and Luca. 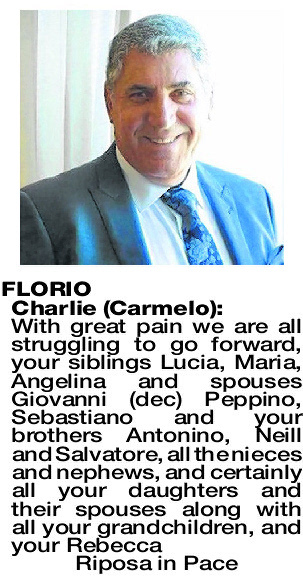 A Funeral Mass for the Late Mr Carmelo Florio (Charlie) will be held at St Joseph's Catholic Church, Salvado Road SUBIACO at 10.00am on FRIDAY (12.4.2019). At conclusion of the Service the Cortege will proceed to KARRAKATTA Cemetery, Railway Rd Karrakatta for a Burial Service at 11.45am. 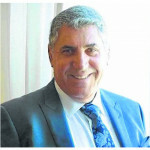 Vigil Prayers and Rosary will take place at St Joseph's Catholic Church Subiaco the evening before THURSDAY (11.4.2019) at 7pm. 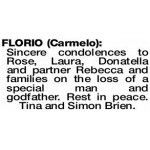 Sincere condolences to Rose, Laura, Donatella and partner Rebecca and families on the loss of a special man and godfather. Rest in peace. Tina and Simon Brien. 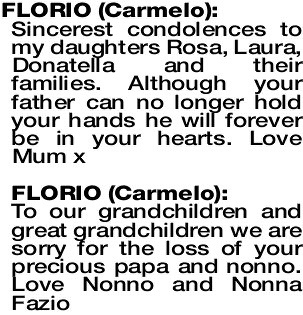 Deepest sympathy to Rosa, Laura, Donatella and Families. 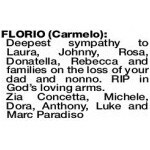 FLORIO CARMELO Deepest sympathy to Laura, Johnny, Rosa, Donatella, Rebecca and families on the loss of your dad and nonno. RIP in God's loving arms. 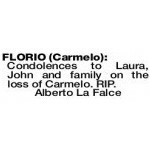 FLORIO CARMELO Condolences to Laura, John and family on the loss of Carmelo. RIP. 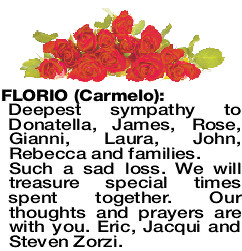 FLORIO CARMELO Our deepest sympathy to our cousins, and family and Rebecca, and family. 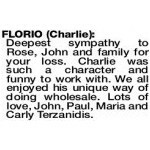 We are saddened of the passing of our wonderful uncle Charlie, who will be deeply missed and forever in our hearts. 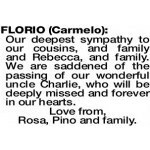 Love from, Rosa, Pino and family. 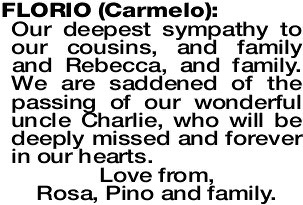 FLORIO CHARLIE Condolences to our cousins and families also to Rebecca and family, Uncle Charlie will be forever loved and dearly missed. Anna, Frank Gangemi and family. 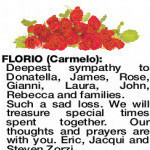 Deepest sympathy to Donatella, James, Rose, Gianni, Laura, John, Rebecca and families. 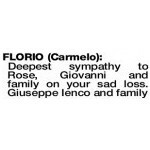 Such a sad loss. We will treasure special times spent together. 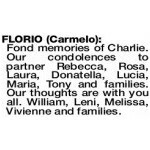 Our thoughts and prayers are with you. Eric, Jacqui and Steven Zorzi. 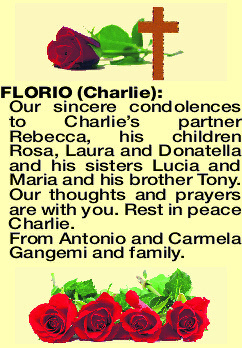 FLORIO CHARLIE Our sincere condolences to Charlie's partner Rebecca, his children Rosa, Laura and Donatella and his sisters Lucia and Maria and his brother Tony. 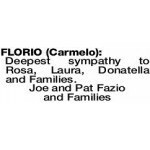 Our thoughts and prayers are with you. 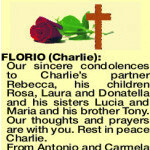 Rest in peace Charlie. 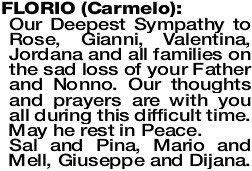 From Antonio and Carmela Gangemi and family. 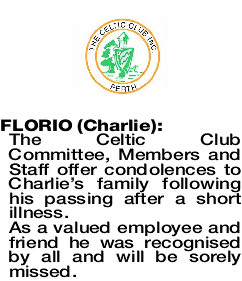 FLORIO CHARLIE The Celtic Club Committee, Members and Staff offer condolences to Charlie's family following his passing after a short illness. 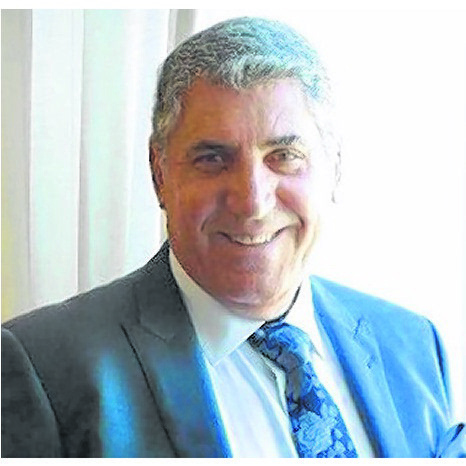 As a valued employee and friend he was recognised by all and will be sorely missed. 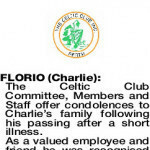 Fond memories of Charlie. 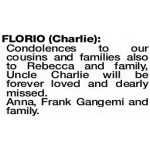 Our condolences to partner Rebecca, Rosa, Laura, Donatella, Lucia, Maria, Tony and families. Our thoughts are with you all. William, Leni, Melissa, Vivienne and families. 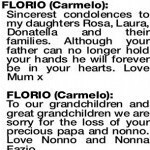 FLORIO CARMELO Our Deepest Sympathy to Rose, Gianni, Valentina, Jordana and all families on the sad loss of your Father and Nonno. 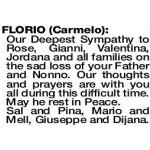 Our thoughts and prayers are with you all during this difficult time. May he rest in Peace. Sal and Pina, Mario and Mell, Giuseppe and Dijana. 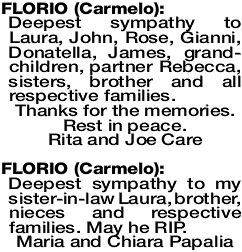 Deepest sympathy to Laura, John, Rose, Gianni, Donatella, James, grand- children, partner Rebecca, sisters, brother and all respective families. 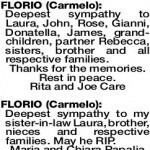 Deepest sympathy to my sister-in-law Laura, brother, nieces and respective families. May he RIP. 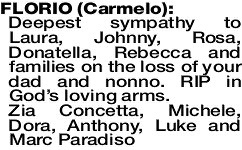 Deepest sympathy to Rose, John and family for your loss. 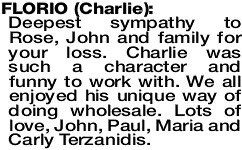 Charlie was such a character and funny to work with. We all enjoyed his unique way of doing wholesale. Lots of love, John, Paul, Maria and Carly Terzanidis.